Benjamin Franklin was born January 17, 1706 and died on April 17, 1790. He is considered to be one of the Founding Fathers of the United States of America. Benjamin Franklin was a noted polymath and expressed this through being a leading author and printer, satirist, political theorist, politician, postmaster, scientist, inventor, civic activist, statesman, and diplomat. His scientific discoveries and advancements are well documented and known in the area of physics for his and regarding electricity. Franklin is credited as being the inventor of the lightning rod, bifocals, the Franklin stove, a carriage odometer, and the glass ‘armonica’. He established both the first public lending library in America and the first fire department in Pennsylvania. 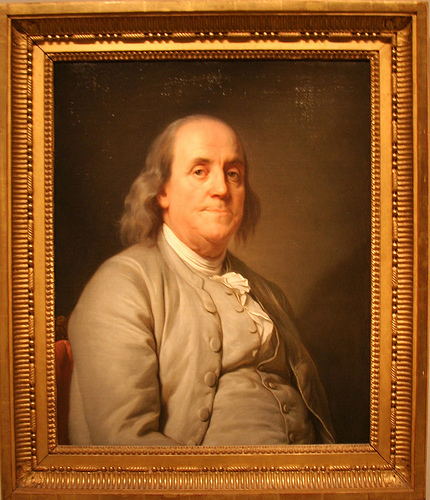 Franklin was the editor and printer in Philadelphia, the leading city in the colonies. He gained his wealth by publishing Poor Richard’s Almanack and The Pennsylvania Gazette. Franklin grew in international stature as a scientist for his famous experiments in electricity and for his many inventions, especially the lightning rod. He was involved in establishing the University of Pennsylvania and was chosen the first president of the American Philosophical Society. When Benjamin Franklin spearheaded the effort to have Parliament repeal the unpopular Stamp Act he became a national hero. He was a noted diplomat and was a major persona in the development of positive Franco-American relations. He held the position of postmaster for the colonies under Britain. This position allowed him to set up the first national communications network. He served as governor of Pennsylvania (officially, President of the Supreme Executive Council of Pennsylvania) from 1785 to 1788. Toward the end of his life, he freed his slaves and became one of the most prominent abolitionists.